Washington (VNA) – Vietnam and the US have reviewed their cooperation in dealing with the consequences of war during a conference in Washington DC on March 26, which was jointly held by the National Steering Committee on the Settlement of Post-war Unexploded Ordnance and Toxic Chemical Consequences (Office 701) and the US Institute of Peace (USIP). Addressing the event, Deputy Defence Minister Sen. Lieut. Gen. Nguyen Chi Vinh underlined that trust between the two governments have paved the way for the development of partnerships between the two countries. Sen. Lieut. Gen. Vinh highly valued the support of Senator Patrick Leahy, Vice Chairman of US Senate Appropriations Committee, in easing some of the pains of war for Vietnamese people. He underlined that local people are willing to help search for US pilots who went missing during the war in Vietnam. Senator Leahy said that over the years, the US has supported Vietnam in many bomb and mine clearance projects, as well as projects to support Agent Orange/dioxin victims and remediate dioxin contaimination around Da Nang airport. Throughout three discussions on the foundation of the Vietnam-US post-war relations; the healing of the pains of war; and the future path to building a sustainable partnership, Vietnam affirmed that the settlement of the aftermaths of war, including searching for US MIAs, is among the top priorities of Vietnam-US cooperation. The humanitarian partnership is the motivation for their collaboration in the future, contributing to building bilateral trust. The US side showed appreciation for Vietnam’s ongoing efforts in searching for US MIAs. At the event, insiders from both Vietnam and the US shared their stories, highlighting the difficulties and challenges in the process of normalising relations between the two countries, affirming that settlement of war consequences is always an important foundation for the bilateral partnership. They lauded the outcomes of bilateral cooperation in dioxin remediation in Da Nang and Bien Hoa airports, describing the results as a vivid symbol of affiliation between the two former enemies. Speaking to the Vietnam News Agency’s correspondent in the US, Sen. Lieut. 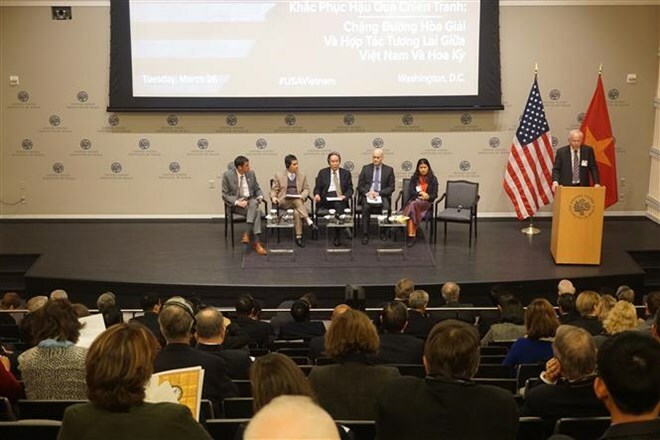 Gen. Vinh said that cooperation between Vietnam and the US in settling the aftermaths of war is not only for humanitarian purposes, but towards building the foundations for growth in their bilateral partnership. Previously, Vietnam only focused on coping with war consequences and clearing bomb, mine, and dioxin sites. However, in the future, the country will align the work with development, environmental, and even science-tech development orientations, he said. For example, Vietnam will work to reduce those afflicted by post-war trauma, so that future generations will not suffer the same effect. Meanwhile, the handing over of 40 ha of clean, detoxified land to Da Nang city has helped to expand Da Nang airport, promoting the city’s development. Through the Da Nang airport project, Vietnam has gain knowledgeable experience related to technology and environmental issues, he said, adding that beyond dioxin contamination, Vietnam has seen problems from pollution of industrial waste, climate change, and environment. Currently, Vietnam is to work on the remediation of Bien Hoa airport, with a total area of 1,000 ha, which is hoped to help promote the socio-economic and security-defence growth of Dong Nai province, he said.